Professional Wireless Communications offers comprehensive campus coverage solutions. Our digital two-way radios ensure that in times of emergency, you’ll know your communications device is going to work. With digital two-way radios, there are ZERO monthly fees and no extra charges for overages for air time or data. Our radios are commercial-grade and will last for 10-15 years as opposed to the 2-3 year lifespan of consumer equipment. No matter what size your school or university is, PWC will consult with your staff and come up with a customized two-way radio communications system that gives you the best possible communications system for your entire campus. We offer a hands-on demonstration of how our radios can best suit your communications needs. With multiple channel options, you can customize your lines of communications. 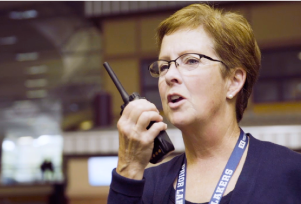 Between administrators, security, hall deans, engineers, counselors and classrooms, PWC two-way radios give you the ability to set up any number of different talk groups to best suit your school’s needs. Do you need a line where only hall deans and security can hear each other? A different line that’s only available for top administrators? How about a security call box stationed throughout the campus for emergency situations? PWC can help you set up a communications system that works exactly how you want it to, with any number of specific lines that can only be accessed by those assigned to them. The benefits of digital two-way radio is that PWC can provide a much more comprehensive solution for giving specific groups the ability to communicate campus wide, without having to hear group talks that aren’t pertinent to them. Your communication lines can maintain a level of privacy and security while still having the ability to unify in emergency cases. PWC two-way radios can give your entire campus staff full communications abilities with a simple device that’s easy to use and rich with features. Professional Wireless Communications prides itself on customer service and attention to detail with every customer. We’ll work with you to assess your needs and develop a comprehensive plan that suits both your needs and your budget. We’ll educate you on every capability your radios offer and we’ll immediately service any problems that might arise. Servicing our radios and making sure our customers are satisfied is a huge part of what we do. We understand that every campus is different, and that’s why we offer so many different products. Our service begins with a consultation period, where we assess what your communications needs are. The Hytera PD5i series is the most popular line in the education market as it suits most campus needs. The PD5i series is a durable feature rich radio in a lightweight and compact device. Available in two models; with and without display, this product is easy to use and offers the potential for multiple groups, individual call (display version) and all call.